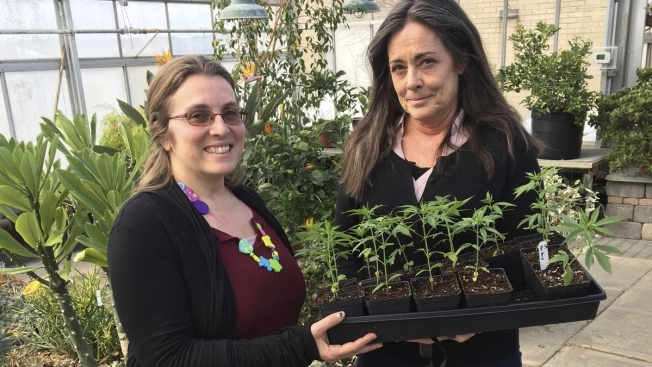 In this Feb. 14, 2019, photo, Jennifer Gilbert Jenkins, left, assistant professor of agriculture at State University of New York, Morrisville, and Kelly Hennigan, who is author of the cannabis minor and chair of the Horticulture Department, hold a tray of cannabis seedlings at the SUNY campus in Morrisville, N.Y. "Majoring in marijuana" may sound like a college dropout track, but at a growing number of universities, cannabis is being added to the curriculum to prepare graduates for a blossoming career field. Grace DeNoya is used to getting snickers when people learn she's majoring in marijuana. "My friends make good-natured jokes about getting a degree in weed," said DeNoya, one of the first students in a new four-year degree program in medicinal plant chemistry at Northern Michigan University. "I say, 'No, it's a serious degree, a chemistry degree first and foremost. It's hard work. Organic chemistry is a bear.'" As a green gold rush in legal marijuana and its non-drug cousin hemp spreads across North America, a growing number of colleges are adding cannabis to the curriculum to prepare graduates for careers cultivating, researching, analyzing and marketing the herb. Research shows there are high times ahead for all kinds of careers in cannabis, ranging from greenhouse and dispensary operators to edible product developers, marketing specialists, quality assurance lab directors and pharmaceutical researchers. Arcview Market Research, which focuses on cannabis industry trends, projects the industry will support 467,000 jobs by 2022. Medical marijuana could be the answer to overcoming the nation's opioid epidemic, but so far the only evidence cannabis can relieve pain comes from patients. That's because the federal government considers marijuana a Schedule 1 drug, highly restricting research. And even in states where recreational marijuana remains illegal, including New York, New Jersey and Connecticut, some colleges have launched cannabis studies programs in anticipation of legalization or to prepare students for jobs in other states. "We're providing a fast track to get into the industry," said Brandon Canfield, a chemistry professor at Northern Michigan University in Marquette. Two years ago, he proposed a new major in medicinal plant chemistry after attending a conference where cannabis industry representatives spoke of an urgent need for analytical chemists for product quality assessment and assurance. The four-year degree, which is the closest thing to a marijuana major at an accredited U.S. university, has drawn nearly 300 students from 48 states, Canfield said. 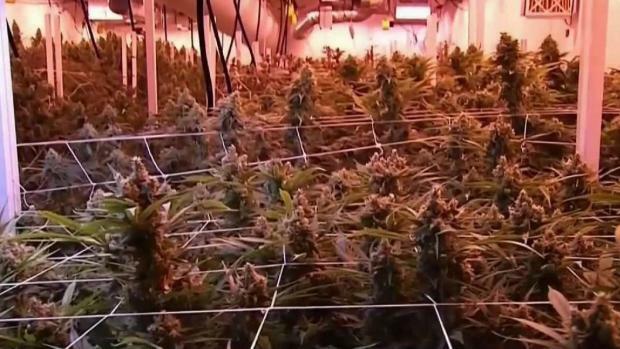 Students won't be growing marijuana, which was recently legalized by Michigan voters for recreational use. But Canfield said students will learn to measure and extract medicinal compounds from plants such as St. John's Wort and ginseng and transfer that knowledge to marijuana. A similar program is being launched at Minot State University in North Dakota this spring. The college said students will learn lab skills applicable to medical marijuana, hops, botanical supplements and food science industries. "All of our graduates are going to be qualified to be analysts in a lab setting," Canfield said, noting that experience could lead to a position paying $70,000 right out of school. Those wishing to start their own businesses can choose an entrepreneurial track that adds courses in accounting, legal issues and marketing. "I came in planning to do the bioanalytical track, maybe go work in a lab," said DeNoya, 27, who was considering nursing school when she heard about the NMU program. "I just switched to the entrepreneurial track. I figured that would better position me, as the industry is still expanding and changing and growing so much." A marijuana-based treatment for severe forms of pediatric epilepsy is a step closer to approval by the Food and Drug Administration. 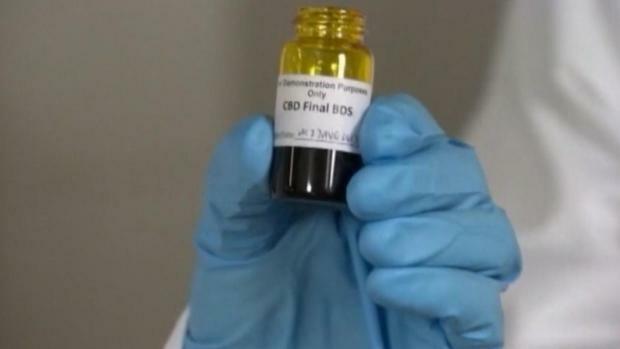 FDA advisors voted Thursday to recommend approval for the drug that's been hailed as a "breakthrough," saying the cannabis-based oil has clear benefits for children with uncontrollable seizures. The expected boom in cannabis-related jobs has colleges responding with a range of offerings. Colorado State University offers a cannabis studies minor focusing on social, legal, political and health impacts. Ohio State University, Harvard, the University of Denver and Vanderbilt offer classes on marijuana policy and law. Universities have done little research on marijuana because of federal restrictions, but that's starting to change. UCLA's Cannabis Research Initiative, which bills itself as one of the first academic programs in the world dedicated to the study of cannabis, has studies underway ranging from medical treatments to economic impacts. Agricultural schools are also getting in on the action. The University of Connecticut is launching a cannabis horticulture program this spring. "We're following the market," said Jennifer Gilbert Jenkins, an assistant professor at the State University of New York at Morrisville, a college in rural central New York that's launching a new minor in cannabis studies in its horticulture department this year. Students work with hemp and other plants rather than marijuana, but can take internships at medical marijuana facilities, Jenkins said. In New Jersey, Stockton University started an interdisciplinary cannabis minor last fall and recently forged an academic partnership with Thomas Jefferson University in Philadelphia that gives students the opportunity for internships and research work in medical marijuana and hemp. "Most of the students are interested in novel business opportunities," said Kathy Sedia, coordinator of the cannabis minor at Stockton. 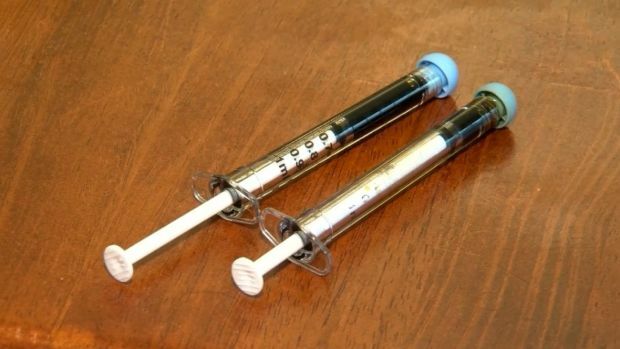 A father from Carbon County, Pennsylvania is making history by treating his daughter with medical marijuana. Jeremy Haloskie became one of the first certified caregivers in the state's medical marijuana program, turning to the program to treat his 5-year-old daughter, Cora. Cannabis businesses range from medical and recreational marijuana to foods, fabrics and myriad other products derived from industrial hemp. The basis for all is the cannabis sativa plant. Marijuana is produced by varieties with high levels of THC, the chemical compound that makes people high. Hemp has only a trace of THC, but produces cannabidiol, or CBD, used in a broad range of nutritional and therapeutic products that are all the rage right now. Marijuana is legal for medical purposes in 33 states and as a recreational drug in 10. While marijuana remains illegal federally, the 2018 Farm bill cleared the way for widespread cultivation of hemp. In New York, where legislators are moving to legalize recreational use of marijuana, hemp has become a new source of income for farmers as well as jobs at processing and manufacturing businesses. The state's first legal hemp crop was harvested in 2016 under a Morrisville research license, which gave rise to the new cannabis minor. "I see a lot more farmers reaching out and trying to find people who know about this new crop," said Colton Welch, an agriculture business student pursuing the cannabis minor at Morrisville. "We're only beginning to see the wide application this plant has." Karson Humiston, founder of Vangst, an employment agency specializing in cannabis jobs, said the industry outlook is bright for students. "More jobs are being created in this space than in any other space in North America, with salaries sometimes more competitive than other industries," Humiston said. "With every new state that legalizes, tons of jobs are opening up." San Francisco's district attorney says his office will toss out or reduce thousands of criminal convictions for marijuana dating back decades, which is allowed under a 2016 ballot measure legalizing recreational use in California. Robert Handa reports.